Today's Post is just a couple of random pictures from a wedding I attended a few weekends ago. It was a Nigerian Wedding and I went in my Traditional Attire. My Dress was Sewn by a seamstress and the hear gear (Called Gele) was tied by a professional who ties Gele. 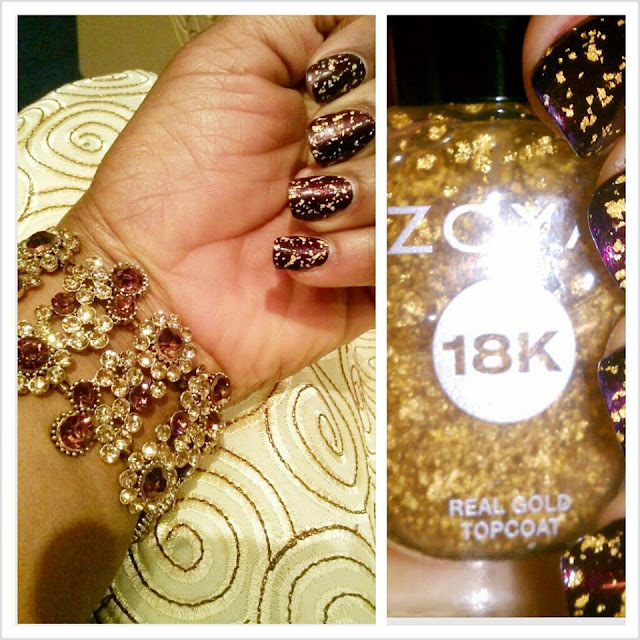 Here's the picture of my Mani, bracelet and A snippet of my outfit. I was all Matchy matchy. The Brown in OPI - EMIO really showed up on my nails. And Zoya Gilty is just FAB!! I Blogged about this mani on THIS POST. Here's my Full Outfit... I Love My Dress so much, My seamstress is amazing and paid attention to details. Here's a up close picture of my face. My makeup was minimal because my Gele and everything else was doing too much already. Lol..
Earrings and Bracelet were purchased from Sam Moon store. I Found out they had a website, and here's the direct link to my bracelet. I couldn't find the earrings on their website. But You can check to see if the store is in your city. Dress was sewn by my seamstress. Nail Polish was Zoya Gilty over OPI- Every Month is Oktoberfest. Ask questions, share your thoughts with me. Till Later darlings. God bless. That is a beautiful dress and I love your make up)) You are very beautiful! OMG DEAR!! You look beautiful!!! I've never been in a Nigerian wedding but I think is totally amazing! The dress is just gorgeus and the gele, never seen that but I like it!! Yeah! Nigerian Weddings are mighty fun! I wish I could document the whole wedding on here, but I didn't wanna breach people's confidentiality... know what I mean? It was super duper fun though. Gorgeous all the way around. Love the mani, the bracelet, dress and gele. You look so fabulous! Gorgeous! you look so fierce! Blushing**.... Thanks darling... I praise God. Your mani is so so cool and I'm in love with that Zoya polish! You look so beautiful and elegant in that dress! Thanks dear. Gilty is indeed so pretty! ! You look absolutely beautiful. What a great outfit! Love everything about it. You look amazing! I love seeing posts like this because it reminds me why this country is so great; we can all celebrate our differences and be who we are. Thank you for sharing this! Aww Thanks! !! You are so right. The diversity in America truly makes it a lovely country. I'm glad you love this post. . So glad I made it. fyne fyne girl no pimples!! oge o! !